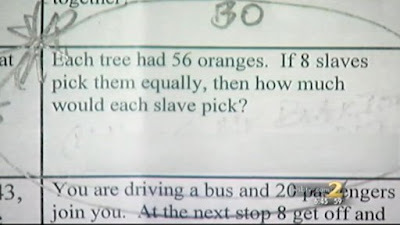 This was the homework given to several third graders in Gwinnett County, GA. Yes, 8 year olds received this as an assignment last Wednesday (January 4, 2012). Welcome to the real world kiddos. There were also questions like "If Frederick received two beatings per day, how many did he get in one week? Two weeks?" Seriously?! And the teachers claimed to have been using it as a cross-curricular exercise. FAIL!!! What's so "post-racial" about this? Good heavens!! I can't even believe that. Let's pretend we were talking about orange trees in ancient Egypt! Heather I wish. Unfortunately that is not the case. This was not the proper venue for exposing 3rd graders to the topic. Homeschooling looks like a better option everyday. Could I Have A Minute of Your Time Please?